Legendary German hero of the Fama Fraternitas and Chymical Wedding of Christian Rosenkreutz of Andrea (q.v. ), and founder of the Rosicrucians. Crowley considered Christian Rosencreutz to have been a man, under a different name, who was a Master of the Temple. See Part III of The Heart of the Master. The Fama Fraternitatis (1614) deals with the life of “the most godly and highly illuminated father, our brother C.R.” who spent his childhood in a cloister, learning Greek, Latin and medicine, traveled to Damascus as a youth where he learned physics and mathematics, then to Fez, where he learned Qabalah, magic and alchemy. From Fez, he traveled to Spain and attempted to teach, but his teachings were rejected. 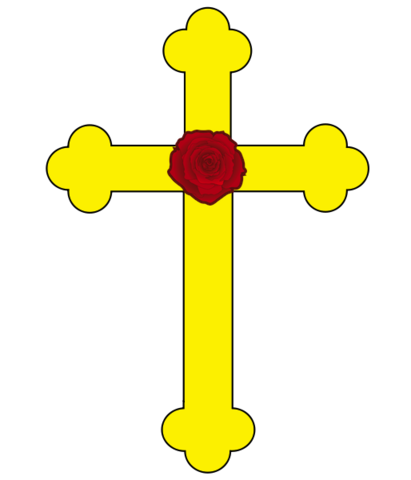 He returned to Germany and established a school, and began to accept students from his old cloister; this was the beginning of the Fraternity of the Rose Cross. Ultimately, the school consisted of eight brethren, and when they had perfected their doctrines and methods, they decided to disperse into all countries to disseminate their teachings. They agreed on six principles: 1. That none of them should profess any other thing than to cure the sick, and that gratis; 2. None of them should be constrained to wear one certain kind of habit, but therein to follow the custom of the country; 3. That every year on the day C. they should meet together in the house S. Spiritus, or write the cause of their absence; 4. Every brother should look about for a worthy person, who after his decease, might succeed him; 5. The word C.R. should be their seal, mark, and character; and 6. The Fraternity should remain secret one hundred years.